Cultural well-being contributes to the achievement of these goals as it encompasses values, shared beliefs, customs, behaviors and identity. These sometimes intangible qualities help shape, define and make Neath Port Talbot the place it is. WHAT DO WE CURRENTLY KNOW ABOUT THE STATE OF CULTURAL WELL-BEING IN NPT? Currently there are limited measures available at a national level to support an assessment of cultural well-being. 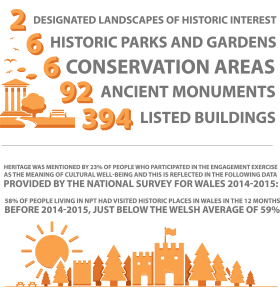 However, several measures are under development and will become available from the National Survey for Wales. 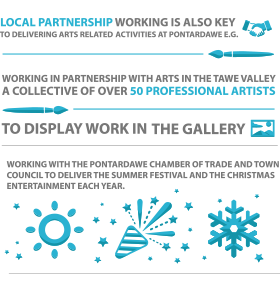 In Neath Port Talbot, a number of groups and locations that promotes and presents activities related to the arts, including the three centers – Pontardawe Arts Center, the Princess Royal Theater and White Hall. Pontardawe Arts Centre was originally built in 1908 as a Public Hall and Institute. The Centre aims to improve the cultural offer in Neath Port Talbot by the delivery of a balanced artistic programme by working in partnership with the Arts Council of Wales and Ffilm Agency Wales. 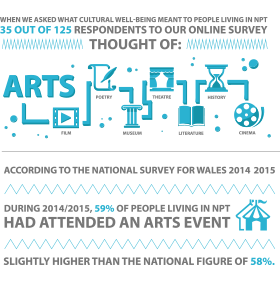 In 2014, Lles Cymru Well-being Wales undertook a Wellbeing Assessment to consider the role Arts Council of Wales venues and exhibition spaces played in promoting individual and community well-being. One interviewee in the above Assessment commented “This building (Pontardawe Arts Centre) is very much part of the community. One meshes with the other”. The Princess Royal Theatre is located in the centre of Port Talbot and was opened in 1996. The Theatre provides quality affordable theatre experiences for the people of Neath Port Talbot. It also brings revenue into the area by attracting visitors from outside of the County Borough. The Gwyn Hall is located in the heart of Neath Town Centre and has been an integral part of Neath’s history since it was built in 1887 and re-opened in March 2012 after an extensive refurbishment. Open seven days a week, the venue has a 393-seat theatre which offers a varied programme including music to suit all tastes, theatre, children’s shows, aerial theatre and dance. It is also in regular use as a first release cinema showing the latest films on its main screen as well as the hugely popular National Theatre Live and Bolshoi Ballet screenings. The Pod offers a designated cinema screen seating 73 in luxurious and intimate surroundings. A wide variety of dance and drama classes are held in the light and spacious designated dance studio. Although we do not have figures for the number of people engaged/visiting the Arts in Neath Port Talbot the following provides a summary of the attendance at the above 3 key venues that promote arts in Neath Port Talbot which shows a gradual increase in the numbers attending those venues over the financial years – 2013/2014, 2014/2015, and 2015/2016. In addition to the three main centres that deliver arts related activities in NPT, the number of community festivals and events held has grown over the last few years. Examples include the Neath Food and Drink Festival which started in 2009 and has since established itself as one of the premiere events in the town’s calendar. Another example is Neath September Fair – an annual historic open air event, in the centre of Neath. There are a number of choirs in Neath Port Talbot which range from traditional Male Voice Choirs to Ladies, Welsh and mixed choirs. There are also a number of gigging bands. There are a number of dance groups in the area and a number of amateur dramatics and operatic societies across the County Borough including the West Glamorgan Youth Theatre Company which is a youth theatre providing performance experiences for young people aged 13-21 in the West Glamorgan area. The aim of the work is to broaden students knowledge of dramatic text by focusing on less traditional, ‘popular’ youth productions. The Theatre prides itself in creating work for a variety of venues across the counties, ranging from Arts Centres to schools and outdoor spaces. NPT has a wealth of historical, archaeological and architectural assets, in particular relating to the area’s industrial history in coal, iron, steel and copper. It also has many older archaeological remains dating back to pre-Roman times. All of these are important characteristics of the area that provide local distinctiveness. The Local Development Plan 2011-2026 contains a number of objectives which includes protecting and enhancing the County Borough’s historical heritage and built environment in order to respect the local distinctiveness of the area. – Peatland and bogs – peat soils capture and store atmospheric carbon dioxide which can be held in the soil permanently when the soil is in good condition. – Saltmarsh on the coast – helps dissipate wave action and high tides to prevent flooding and erosion. connectivity for pollinators and food for livestock. – Woodlands – help clean the air of pollutants, flood alleviation, reducing the heat island effect in urban environments, provide oxygen and timber products. The varied habitats also bring job opportunities, particularly in the tourism sector where NPT is well known for its waterfalls, country parks, seafront and recreational activities such as glamping and mountain biking. The accessibility of these resources throughout the County Borough provides opportunities to improve health and wellbeing, for example through walking and other outdoor activities. At the beginning of the 20th Century nearly half of the population in Wales spoke Welsh. The percentage of Welsh speakers however, decreased throughout the 20th Century to as little as 18.7% in 1991. While it increased to 20.8% in 2001, principally owing to the growth in the teaching of Welsh as a second language in schools, the latest census figures (2011) suggest that the amount of Welsh speakers has again decreased to 19% from 20.8% in 2001 – a decline of 1.8% (21,976). This is reflected locally whereby between 2001 and 2011, NPT also experienced a 2.7% decline from 18% (23,404) in 2001 to 15.3% (20,698) in 2011 which equates to a 2,706 decrease in the Welsh speaking population. Although there has been a positive trend in younger people being able to speak Welsh, more children aged 3-4 years in 2011 (550) were able to speak Welsh in NPT than 10 years previously (518) and more younger people aged 16-19 years in 2011 (1,522) were able to speak Welsh in NPT than 10 years previously (1,424). Five of the eight community areas in Neath Port Talbot have a higher percentage of Welsh speakers compared to County Borough figure of 15.3%. 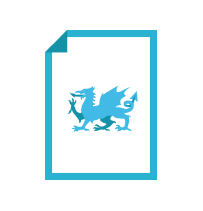 There are areas within the County Borough where the language is an integral part of the social fabric and which contain very high levels of Welsh speakers. 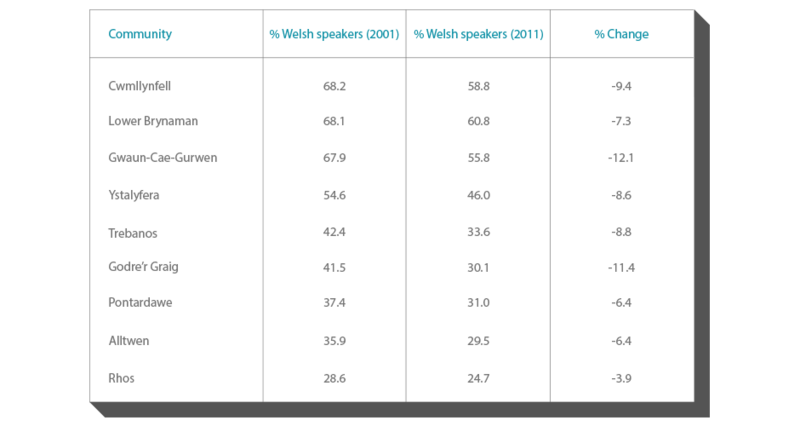 The Amman and Swansea Valley areas are the stronghold of the language in Neath Port Talbot with the Pontardawe area and Dulais Valley also containing communities where more than the welsh average of the residents speak the language. These Valley communities are where Welsh language skills are highest with a high percentage that can speak, read and write Welsh. However, these traditional Welsh speaking communities have witnessed a marked reduction in percentage terms and numbers of Welsh speakers between 2001-2011. As set out in the tables below, some communities such as Godre’r Graig and Gwaun-Car-Gurwen has seen a decline of more than 10% within a decade. It could be argued that the area that stretches from Trebanos to Cwmllynfell and Rhos to Gwaun Cae Gurwen is the one most important in the County in terms of its linguistic significance because they include some of the highest percentages of Welsh speakers. Welsh language education has a strong influence on the vibrancy of the language both through Welsh medium schools and via adult learning classes. Welsh-medium education is an integral and essential part of learning in Neath Port Talbot. 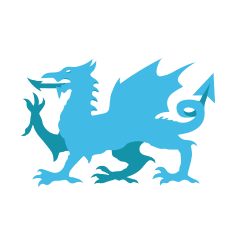 The Council’s draft Welsh in Education Strategic Plan 2017-2020 (WESP) recognises that language and culture are critical parts of an individual’s identity and details how the Council plans to support and further develop Welsh language education in schools and in the wider communities. During the spring and summer of 2015, almost 1000 schools took part in the Sport Wales School Sport Survey, making it the biggest survey of its kind in the UK. The results of the survey showed an increase in young people taking part in sport or physical activity three or more times a week from 40% in 2013 to 48% in 2015. In 2015, the percentage of children and young people (3-11 years) engaging in at least three occasions of activity per week in NPT was 54.7%, higher than the national figure of 48%. In 2015, Neath Port Talbot had the highest percentage of pupils in years 3 to 11 ‘hooked on sport’, the highest percentage of pupils frequently participating in extracurricular sport and the highest sport club membership (63.2%) of the 22 local authorities in Wales. 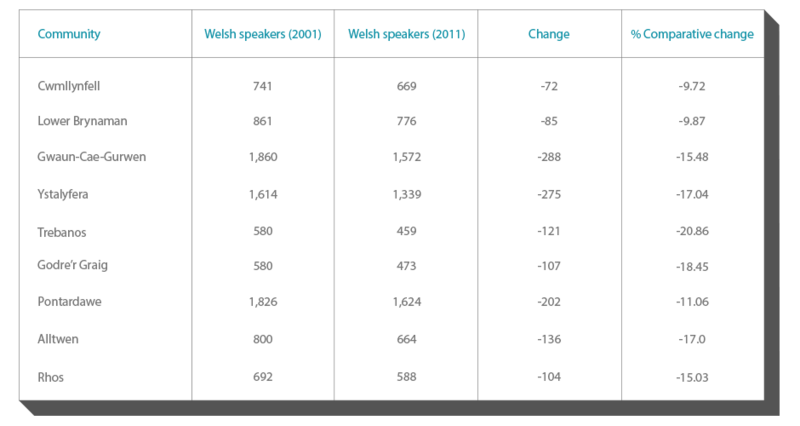 The information presented in the table below shows that male participation rates are slightly higher than female participation rates in both age categories. Sport Wales also undertake the Further Education Survey which focuses on the sport participation of students aged 16+ attending further education provision in Wales. 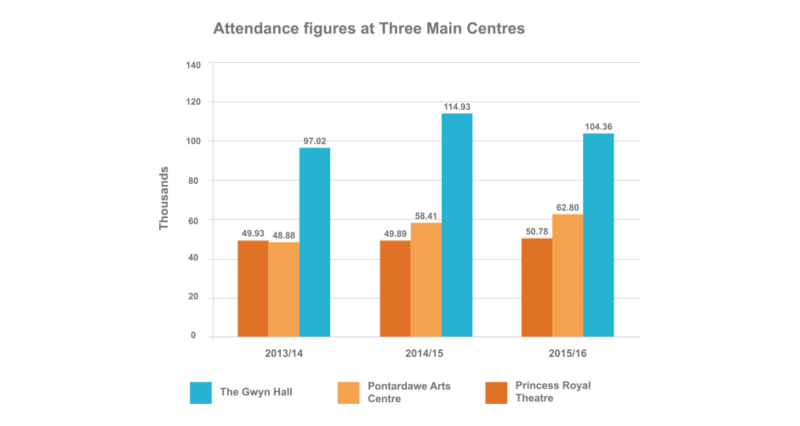 In 2015, 44% of students attending Neath Port Talbot Group of colleges participated in activity on at least 3 occasions per week compared to the All Wales figure of 49%. Participation rates in those aged between 16 and 19 were higher (46%) than in those aged 20+, and overall males tended to have higher participation rates (50%) than females (37%). Neath Port Talbot hosts a number of sport and leisure facilities catering for all ages. From world class mountain bike trails in the Afan Valley, the adventure golf, skate park, aqua splash play pool and the adventure playground on Aberavon seafront, horse riding opportunities in the Amman Valley and a range of walking trails through woodlands, parks and alongside canals. 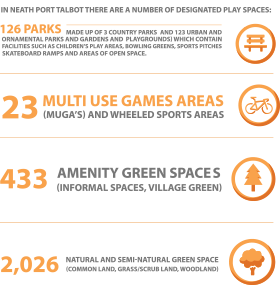 – 126 parks (made up of 3 country parks, and 123 urban and ornamental parks and gardens and playgrounds) which contain facilities such as children’s play areas, bowling greens, sports pitches, skateboard ramps and areas of open space. Artificial pitches also make a key contribution to getting people active. In Neath Port Talbot there are two, full size 3G pitches (in 3G the artificial grass ‘blades’ are supported by a thin base layer of sand and an infill of rubber crumb). There are also four sand filled, dressed or water filled artificial pitches and 10 smaller artificial pitches or 5-a-side/carpeted courts. Celtic Leisure manages professional and accessible leisure centres across the Borough. They provide a wide variety of services including fitness classes, fitness suites, weights rooms, swimming pools, racquet sports and outdoor team sports to suit all ages and abilities. 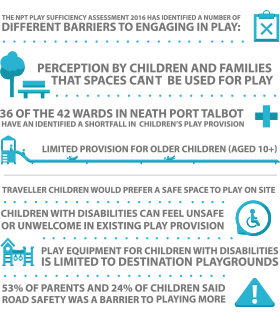 In Neath Port Talbot there are 25 youth clubs, 12 after school clubs and 1 open access play club. One third of supervised play settings (including childcare) offer a bilingual provision. O Gam I Gam, Interplay and SNAC provide play opportunities for children with disabilities. Volunteering was mentioned by a number of people who took part in the engagement exercise as a factor that could improve cultural well-being. There are currently around 52,000 formal volunteers in NPT with the most common form of volunteering being with an organisation, helping run everything from children’s activities both within and outside school, to sport and exercise, health and social care and community and faith-based groups. The number of informal volunteers in NPT is currently 71,168 and the most common types of informal volunteering are doing errands, caring for children, keeping in touch with a housebound person, providing transport and giving advice. There many other forms of volunteering including virtual volunteering, micro volunteering, employer-supported volunteering, volunteering for accreditation, internships, volunteering as a work-related experience, civic volunteering. of residents feel that they have a feeling of belonging to the local area, highest of all local authorities in Wales, and higher than the Wales figure of 82%. of residents feel that people from different backgrounds get on well together, higher than the Wales figure of 79% 86% of residents fell that people in the area treat each other with respect and consideration compared to the Wales figure of 79%. In NPT there was a decrease in the percentage of people identifying themselves as Christian from 72% in 2001 to 58% in 2011. During the same period there was also a noticeable increase in people declaring that they had ‘no religion’, from 19% in 2001 to 34% in 2011. This is similar to the picture across Wales. The majority of those living in Wales were born in Wales; this number is decreasing slowly over time but this is likely to have an impact on culture locally. In NPT, there was a decrease in the percentage of people born in Wales from 90% in 2001 to 87% in 2011. BE AFFECTED BY FUTURE TRENDS? Over the past few years, there has been a reduction in the amount of public funding for arts & cultural services across NPT and the expectation is that funding will continue to reduce or at the very least stand still over the medium term. Planning Policy Wales states that the future well-being of the language will depend on a variety of factors including demographic change and the negative impact inward and outward migration can have on the Welsh language, for example, the ONS Census 2011 reports between 2001 and 2011, the numbers able to speak Welsh over the age of 75 fell from 3,008 (25.4%) to 2,149 (17.6%). Coupled with the fact that the younger generation migrating out of the County Borough are more likely to be Welsh speakers than those migrating in, these could be indicators as to why the percentage of Welsh speakers in NPT has dropped between 2001 and 2011 and is likely to continue to drop in the future due to other factors including: lack of language transfer in the home; lack of confidence in users; mixed – language marriages; and more deaths than births among Welsh families. There are a number of future challenges for volunteering in NPT, including funding for and of volunteer-involving organisations (including provision of volunteer expenses), availability of suitable volunteering opportunities and placements, greater demand from large corporate bodies to involve their own staff in volunteering, availability of the right skills mix, and ability of volunteer-involving organisations to provide required training for volunteers.